Can I restart a new plante from a growth. of a Ponytail Palm……. I have a ponytail around 5/6 feet tall and it hs around 5 shoots, around 12 inches long, if I cut one and use rooting powder can I succeed in it to restart a continue to grow as a ponytail plante. These are hard to make root when done from cutting. It can be done, but they typically fail. 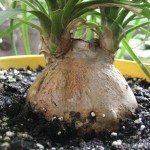 Sometimes they will shoot offsets below the soil line, and these are suitable for using as a cutting, since they have already developed roots under the soil.